Hugh Weathers, South Carolina’s Commissioner of Agriculture, is asking South Carolinians to join him in celebrating Farmers Market Month in August by shopping at a farmers market in their community. 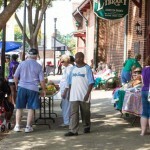 Governor Nikki Haley has again proclaimed August as Farmers Market Month in South Carolina. Farmers Market Month is an extension of National Farmers Market Week, which runs August 4-10, and celebrates farmers markets as critical food hubs that bolster regional economies, while increasing access to nutritious foods. How fortunate that the communities of this area have three such markets to choose from: in Edgefield, Johnston and Ridge Spring. 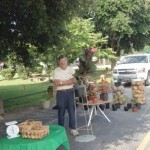 “A collegial group,” says one visitor about the Johnston Farmers Market; in Edgefield an interesting variety of produce, from fruits to vegetables, ducks to cakes; and in Ridge Spring a longstanding, dependable assortment of produce and plants. And each market of course features crafts and arts from time to time. That’s why two are referred to as the Farmers and Artists Markets. 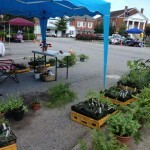 Travel Highway 23 on Saturday and one can enjoy farmers market shopping from one end of the Edgefield-Ridge marketing area to the other. Edgefield opens somewhere around nine o’clock, or sooner, or later. Vendors collect under their tents or beside their booths to produce a sale; unique to Edgefield there is curb service as a car can draw up to a booth and the vendor steps forward to offer his goods. (That happened a number of times last Saturday.) Cakes are available, the earlier in the morning the better, from Becky Turner (for the Civic League) or the Cake Man (Phillip Trotter). 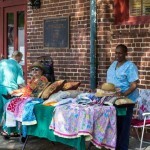 Some items seen in Johnston will make their way to Edgefield – like pillows and aprons. The fact that the two towns have two separate days for the market is an advantage for some, to sell at both venues in one week. Most unusual in Edgefield has been the duck eggs and baby chicks from the Womack farm. They may not be there each week, but often enough. Johnston is on Highway 23 also, but their market happens on Thursday afternoon – beautiful, colorful produce, arts and crafts, and a really neat setting that provides shade from the trees and a view of the town at a busy time. At different times meats and seafood are available. A number of citizens find their way to the market on Thursday and will be found enjoying a bench rest for a while – a great small town entertainment is sitting and watching people. Those banners that the Town of Johnston has provided has given the market space real character and “promise” during the rest of the week of what is to come on Thursdays. At the other end of Hwy 23 in this marketing area is Ridge Spring, the town that has had a Saturday market for many years now, a place where big farms like Titan and smaller producers like Loris and Robert Yonce (whose day lilies are famous) can bring their produce to sell. There are seldom tents on display in Ridge Spring – the setting features large trees and a paved area just perfect for their market, and it is just off the main thoroughfare. This past Saturday there were figs for $1.50 a pound and bread, made by Samantha McClure of Monetta, two select items and worth the purchase. 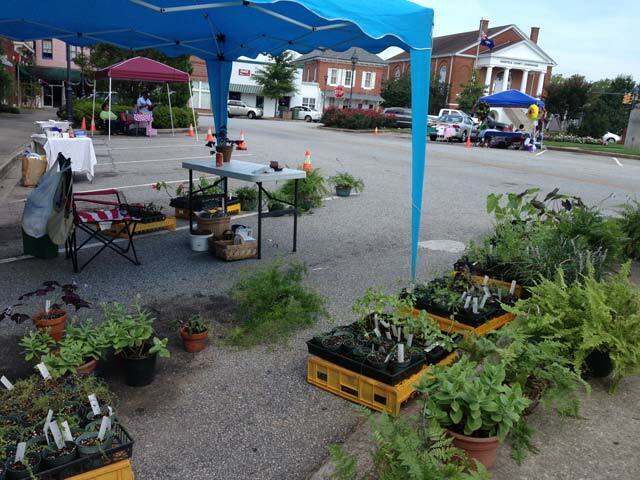 Harriett Householder was there with her plants for sale, and unlike Piekielniak in Edgefield who fills the corner of the square with lots of plants, Harriet puts out some of her favorites and the others are nearby in her trailer (at least that was true on Saturday). Congratulations to the three towns. These markets are not just for buying and selling; there is lots of socializing and philosophizing going on under those tents and trees as neighbors meet neighbors. If you miss your breakfast, there is probably something you can eat at the market – like hotdogs and tilapia in Edgefield last Saturday, fresh fruit or homemade bread ready for munching at Ridge Spring, and on Thursday in Johnston, there are home-baked goods also to “hold” the buyer until he gets home (in this case at supper time).